Spent a lot of yesterday moving plants outside, and then (after looking at the weather forecast) back inside again. The location is sort of new: the husband poured a slab of concrete on the north side of the garage last fall, which means I've got a decent-sized, mostly-shaded, level surface to fill up with plants this summer. Unfortunately, they're not accustomed to outdoor light yet, so even if it had been warm enough to leave them out, I couldn't have done it. The side of the garage still gets some direct sun in the afternoon. Sunburn isn't the worst thing in the world, but it's worth going to a little extra trouble to avoid. So for a while, I'm going to be moving plants out every morning and then in again every night. As for the pets, Sheba had a pretty nice Friday; both the husband and I were outside a lot, so she got to sniff every square inch of the back yard. Several times. Apparently it's fascinating. DISCLAIMER 1: I was not provided a copy of this book for review by Timber Press, and am a little irritated about this because they knew I wanted one. Instead, I paid for my copy. Like a commoner. Plant Breeding for the Home Gardener does two things particularly well. The first is that Tychonievich manages to squeeze a lot of specific information into a pretty short book (216 pp. ), and does so without obscuring it in a lot of jargon or oversimplifying it to the point of uselessness. I had two disappointments with the book, one about the content and the other about the format. Both are comparatively minor. The disappointment I had about Plant Breeding for the Home Gardener's content is that not one houseplant was discussed.1 It's hard for me not to take that a little bit personally, especially since we'd established some time ago that the universe does in fact revolve around me so this is just careless, Joseph. 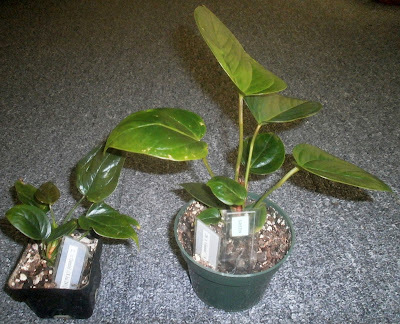 As long as we're sort of on the subject, here are Anthurium seedlings number 2 ("Alexis Mateo," left) and 26 ("Peaches Christ," right).5 These were both started on 18 July 2011, and lived in essentially the same location and received essentially the same care until 1 January 2013, at which point Peaches was repotted. Why is Alexis lagging so far behind? No idea. The formatting disappointment: the section on genetics would really have benefited from a diagram or two. The rest of the book was a really easy read, and I was excited about it anyway, so I blew through it really fast with no problem, except for this one bit in the genetics chapter. Tychonievich uses an extended metaphor about cookies and cookie recipes, which was initially clear, but then after a few paragraphs I started thinking about how hungry I was, and by the time the metaphor came back around again, I was too distracted to follow. Re-reading cleared things up. This section stands out mostly because it's the only part of the book that wasn't pretty immediately clear, and it's an important, if small, section of the book. If those two things are my biggest complaints about the book -- and they are -- then obviously I still like it pretty well. 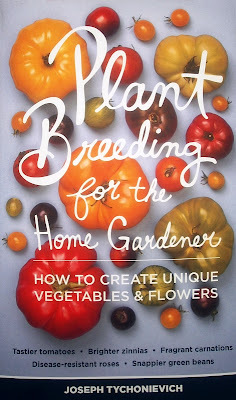 I don't want to get too detailed about the specific information in the book, but I certainly learned things, and there are solutions for some plant-breeding problems that I intend to try at some point. Probably also an explosion of new seedlings, too. I'm looking forward to it. 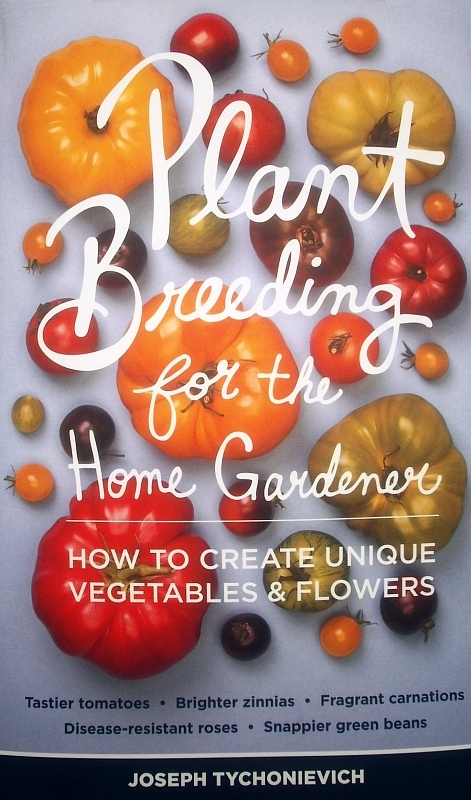 You can buy Plant Breeding for the Home Gardener directly from Timber Press, from Amazon, or Barnes and Noble. Joseph Tychonievich's also writes the blog for Arrowhead Alpines, which you should have been following already but I'll let it slide just this once. 3 (Anthurium and Schlumbergera.) There are no cacti mentioned at all, and only one mention of an aroid -- Arisaema triphyllum, or Jack in the pulpit -- which is only a single sentence about the flower structure. 4 Not that there aren't still plenty of plants covered. 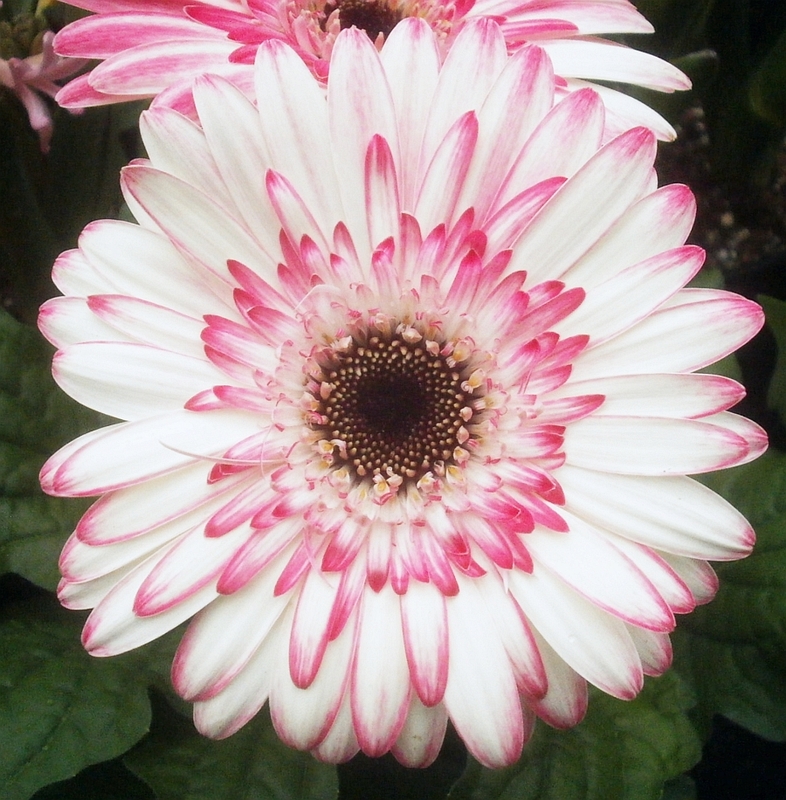 And a lot of the information is general enough to apply to plants not specifically discussed. The plants that get the most page space are: columbines, coleus, daffodils, Dianthus (the whole genus), hollyhocks, roses, snapdragons, zinnias, beans, cabbage/broccoli/cauliflower/etc., corn, lettuce, squash, and tomatoes, but violets, petunias, radishes, daylilies, and assorted other things make appearances as well. 5 For new readers, who might not be aware: I have been giving the Anthurium seedlings the names of drag queens (and roller girls/guys), both real and imaginary, because it amuses me to do so and they're mine so you can't stop me. These are not necessarily the names I'd give them if they were actual patented cultivars. Though they're not necessarily not the names I'd give them either. I haven't named the Schlumbergeras, though I'm open to suggestions if someone wants to throw out an idea. The 2013 orchid show was smaller than previous years, it seemed like, and a larger percentage of the orchids they had were in roped-off displays. Not the worst thing in the world, but inconvenient for taking photos, since most of the plants they had were too far away for me to photograph. Which I took to mean that it was probably okay, but only as long as nothing bad happened. And what are the odds of that? And it wasn't like there weren't plenty of plants around that were accessible enough to get pictures of anyway. I mean, it wasn't like there were any in the roped-off area that I was just dying to get a photo of. So this is the first of a few pictures during the next year that were taken from a distance, with a shaky camera, because I didn't trust myself not to fall into the display and crush everything if I got closer. Which in retrospect is pretty silly, since she was basically saying to go ahead, but oh well. 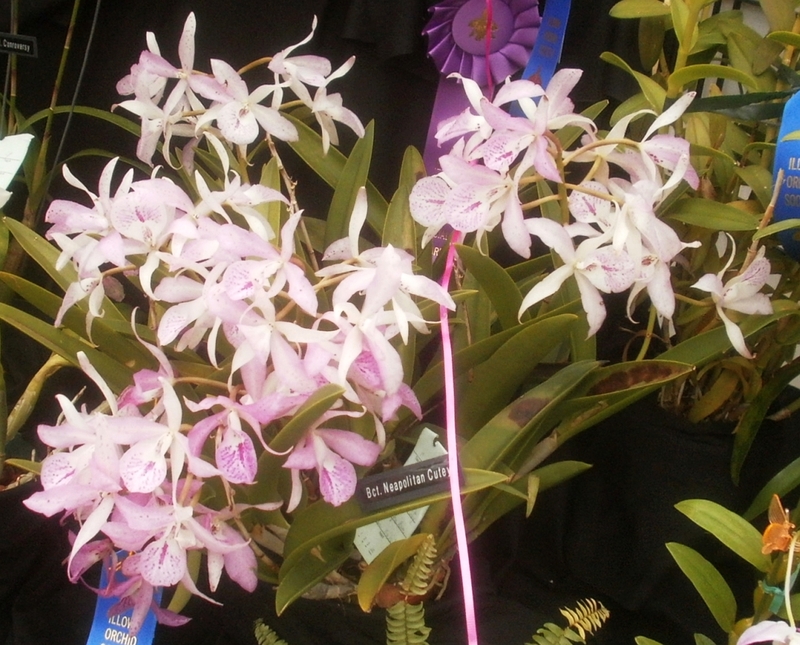 Brassocatanthe Neapolitan Cutey is Brassocattleya Hoku Gem x Brassanthe Maikai; it takes after the latter a lot more than it does the former, apparently, which is too bad, 'cause Hoku Gem is pretty. 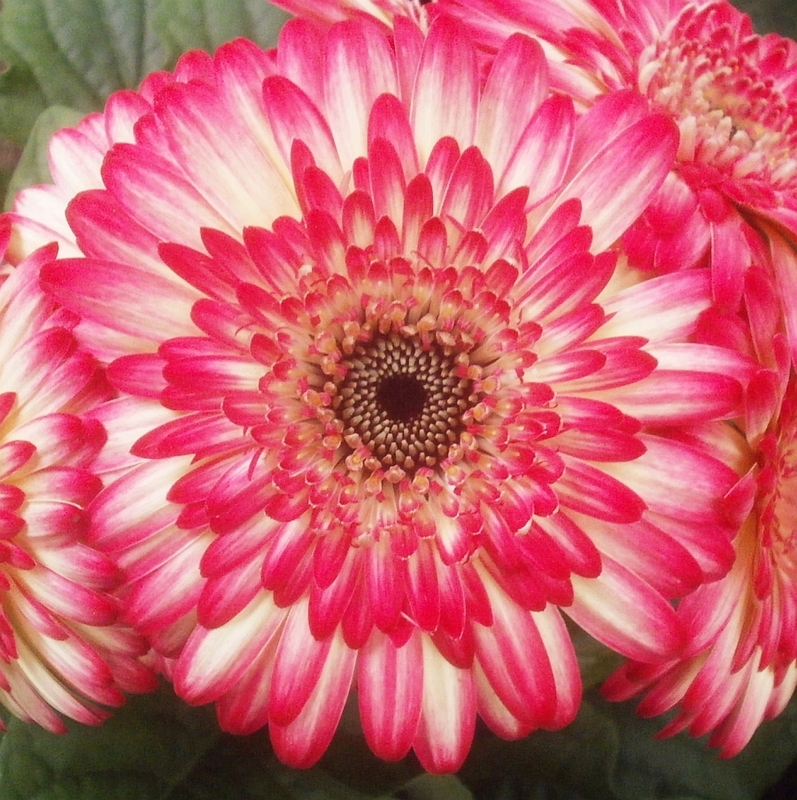 It's been a very long time since I've mentioned Gerberas here. And there's a good reason for that: I don't like them very much. Some of this is because they were hard to keep in the greenhouse (too wet and they mildew, too dry and they wilt), but even the healthy ones seem a little bit too much, in a bad way. Aggressively cheerful motivational speaker types, almost. Like if gerbs could talk, they'd spend all day spewing something like, It's just GREAT to be here with all of you on this FANTASTIC and BEAUTIFUL day and isn't it WONDERFUL how we can all get together and have FUN like this and now I'm going to burst into song IF YOU'RE HAPPY AND YOU KNOW IT CLAP YOUR HANDS. . . . These were at the ex-job last Wednesday. Neither one had an ID tag. I don't know if this kind of flower, with the two-tone petals, is a new thing in the world of Gerbera daisies -- it's not a part of horticulture I keep up with, for obvious reasons -- but it's at least not very common; most of the pictures that come up in Google image search are of red, orange, and pink single-color flowers. So it seemed newsworthy.